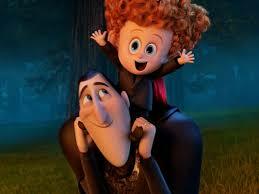 I don’t mind the Hotel Transylvania movies. If given a choice between that or, say, Pixels (which my kids have made me watch… twice. Pray for me. ), I will totally take one of those films. 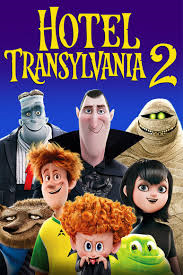 Hotel Transylvania 2 is one sequel that I actually enjoy more than the original. However… there’s a but. A huge but. Sure, it’s funny, but it has a theme that’s really not that great if you take a long, hard look at it. Namely, that you need to control your family and force them into a particular set of conditions in order to fully love them. A great family movie about acceptance on your own terms. Thoughout the first film, Dracula (Adam Sandler, who strikes me as an odd choice as Prince of Darkness) goes to great lengths to keep his daughter Mavis (Selena Gomez) by his side; it extends into the second film, and it’s just as disturbing. 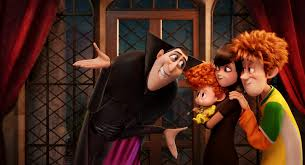 Drac is more than a little involved in his daughter’s life: despite that the existence of monsters is out in the open, he still insists on having his daughter and her husband Johnny (Andy Samberg) live at the hotel. The motives for this aren’t exactly pure: Drac openly refers to Jonathan’s job as a “real job. Not a cheap excuse to keep Mavis happy so you’ll never leave here.” He hosts a lavish wedding ceremony and reception, during which he dictates the duration of their first kiss and sings a song in which he transfers ownership of his daughter (“Now you’re Johnny’s girl”) while still maintaining that she’s still his little girl. When Mavis’s pregnancy is announced, Drac attempts to oversee her diet in the hope that the baby is vampire. He worms his way into the delivery room, disregarding the rules in an attempt to check out the newest addition. That’s overstepping so many boundaries that I feel like this girl needs a course on personal limits and how to establish it with an overbearing parent. It’s his fixation on his grandson Dennis that takes him from obsessive father/grandfather to unaccepting of the child’s core nature and best interests. During her pregnancy, Mavis calmly accepts that her child may wind up being human, telling her father that it doesn’t matter so long as her child is healthy. Mavis displays a type of calm and maturity that her father doesn’t possess, as he asserts his disbelief of the possibility: “Human? With thousands of years of Dracula genes? Not gonna happen.” When the child doesn’t display signs of vampirism, Drac refers to him as a “late fanger,” then goes on a quest to unleash the child’s latent genes. Now let’s step back for a moment: up until the last 10 minutes of the movie, this kid is all human. Yet Drac resorts to tactics such as scaring the child, convincing his friends to murder woodland animals, and throwing the kid off of a high tower in the name of keeping his daughter and her family with him. In fact, he refers to Jonathan’s trip with Mavis to California as a ploy to distract her while he forces a change in her son: “Keep her distracted and happy, but not too happy.” Once he’s a vampire, Drac reckons that Dennis will be better off at the hotel, which means that his ultimate end game involves a core, changeable part of identity that requires special sheltering only he can provide. The problem here is that as a human, Dennis would most likely be better off in California, which Mavis actively explores despite that the move would make her feel out of place. And kudos to Mavis for exploring a life-altering, drastically different environment for the benefit of her child’s safety. For Mavis, it’s about the best interest of her child; for Drac, he feels that he must control the very nature of a little boy, going so far as to proclaim, “I gotta fix this kid, now!” One displays true unconditional love, while the other displays a desire for retained control. Vampirism is where Drac’s expertise lies, and his identity as the unchallenged parent – the one that raised his daughter on his own from infancy – means that he has a compulsive need to not only be right, but to oversee all aspects of life. With a human child, he can’t do that because it’s out of his scope of knowledge; with a vampire, he can keep his family close to him, negating any need for personal growth. Bearing that in mind, this film had the potential to make a true statement about acceptance and unconditional love, and yet the opportunity was blown. At the climax of the film, Dennis grows his fangs and saves the day by defeating Bela. We’re supposed to rejoice because this means that he’s a vampire and can stay with his loving parents and grandfather in Transylvania. However, this defeats an important message: the child should have been loved, accepted and defended no matter what, and an ending with a human Dennis would have been far more impactful. Given, Drac gets an inkling of this epiphany when Dennis is missing, but he regresses once the child asks him if his being a vampire means that he gets to stay at the hotel. In this respect, Dracula achieves his original goal: his daughter – and by extension, his son-in-law and grandson – will remain living with him under controlled conditions in a fortress he built ages ago with the sole intention of keeping his baby girl safe. The jokes about creating a job for her husband to keep her there will persist. He won’t have to worry about the child being human and thus prone to harm because Dennis is obviously a vampire now. Jonathan won’t even put up a fight for independence because he loves the environment. Life gets to keep going the way it was before the events of the film because Drac has gotten what he wants: a vampire grandson that he can shut off from the rest of the world in his hotel. Rather than giving the audience something powerful – the unconditional love and acceptance of a human grandchild, the chance to grow, and the experience of life without a crippling codependency on a child for happiness – this film gives us the bow-tie ending: everything gets wrapped up neatly, with the main character knowing best and happily accepting the conditions he wanted as expected and realized. Rather than deal with the real life struggles that everyone else faces – separation, anxiety, acceptance – this film took the easy way out, making the obsessive control freak something endearing when it’s really not. Mavis tells her father early on in the film, “You can’t just make somebody something they’re not.” This is a powerful message, one that’s relevant in the times of forced gender and cultural expectations. We have adults that can’t separate fully from parents, and people that question their core identities as they stack up to parental expectation. This isn’t new ground. However, we also have kids struggling with this every day, and some of those kids went to see this movie. What did they learn here? Just work harder at being what someone else wants you to be. Everyone will be happier in the long run, and you’ll get the acceptance you’ve always craved.